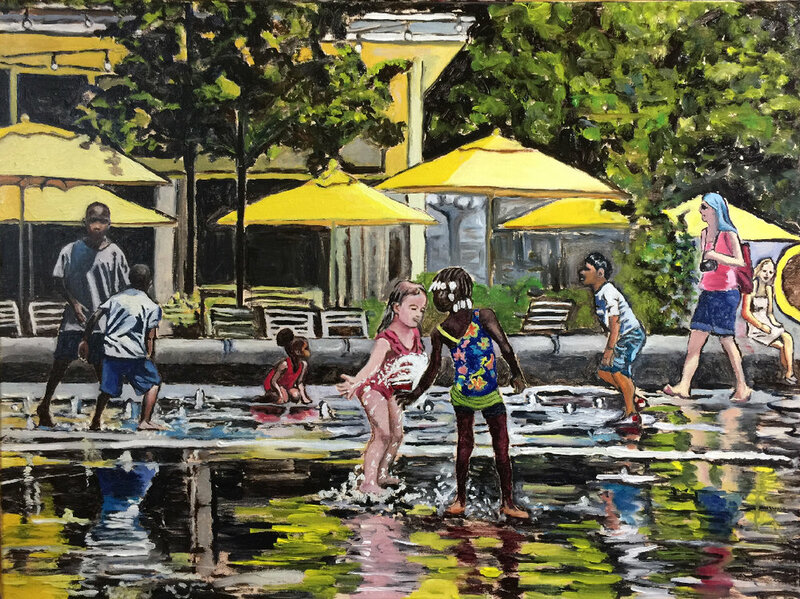 To learn more about the Manayunk Roxborough Art Center’s artists, MRAC’s Esther Griffin will be talking to several members, learning about their life, their work and their membership of the MRAC. First up is Christina Tarkoff. Tarkoff studied art at Temple University, Tyler School of Art. After a 20-year break from painting, during which time she raised a family and started her own graphic design company, she is back to her artwork in full force. Not only is Tarkoff a valued member of the MRAC, but she is also affiliated with the Philadelphia Sketch Club and a Professional Artist Member of the Mainline Art Center. Tarkoff takes the lead on the next MRAC exhibition ‘Generations’, which opens with a reception on Sunday September 9th 2018 from 12 – 3 pm. Entrance is free and all are welcome to join Tarkoff and other members at this new show. The exhibition continues Saturday and Sunday September 15 & 16, 2018 from 11 am to 3 pm. What sort of art do you create? I make oil paintings in the "figurative realism" style, which can be defined as a style in which "realistically depicted human figure(s) are central to and a principal focus of the work." My paintings come from a combination of observation, interpretation, and composition. I use my visual language as an artist to restructure and interpret what I see. I aim to create meaningful work that touches people. How long have you been a member of MRAC and what do you like best about the Art Center? I have been an MRAC member since July 2016. I love MRAC. After a 20-year hiatus from art, I started painting again in 2016. I took a big emotional leap by submitting to the MRAC July 2016 Juried Show. Thanks to all the CoOp members, I felt at home at the Art Center immediately. What I love most about the center is its artists. We have lively monthly meetings and I believe that together we help the Art Center grow and support our mission that "Art Brings People Together." I love that mission. I also love the Art Center's gallery space. It's not too big, not too small. You got an honorable mention at the MRAC 10th Annual Juried Show last July. What was that work about? Yes, thank you! My "Women Who Shatter Barriers" series of four 8x10 inch collage oil paintings were chosen for Honorable Mention at the Annual Juried Show. It is an honor to be recognized for these paintings. I was inspired to begin the "Women Who Shatter Barriers" series in March 2018 as a response to the "Me Too" movement. I was awed by the brave women who came forward to tell their stories. It made me think about all the women, famous and not, who break barriers with their talent, courage and "chutzpah" to challenge the status quo. Misty Copeland, Maya Angelou, Ruth Bader Ginsburg, and Malala Yousafzai are the subjects of my first four paintings. I was proud that the series is gaining attention and support. Three of the four paintings sold at the Juried Show. So that is always welcome support for the artist as well as the Art Center. I will be continuing the series and I have a long list of women to paint. If anyone has suggestions, I'd love to hear! You are the driving force behind the upcoming show 'Generations'; a show about creative families, showing art of several generations in one family. How did you come up with this concept? The "Generations" Show concept began as a collaborative idea. Susan Kelly, Marilyn Lawrence (MRAC CoOp Members) and I were discussing our artwork at the MRAC "Philadelphia Places" show in 2017. We started talking about how we are all have families that make art. So, we said, hey, that is a great idea for an MRAC Member's show. And Voila! The result is the MRAC Generations Show! We have 14 MRAC CoOp Artist members and their families participating in the show. I am really excited about this exhibition and how the show represents the vision and artistic thread connecting our members and their families. This inter-generational exhibit celebrates MRAC members & their families who make art. It's a fun show for everyone. What would you advise future MRAC members? JOIN us. We are all volunteers. MRAC has no paid employees. It is a labor of love for all of us. We are all strong folks who love art, love the humanities and love the center. We are a community of artists, writers and poets. I know that my art has thrived since joining and becoming active in the MRAC community. Nothing is easy, art is hard work. Giving and receiving support from fellow artists makes the art gig a bit more fun and I look forward to the challenge of participating in our varied and creative shows. 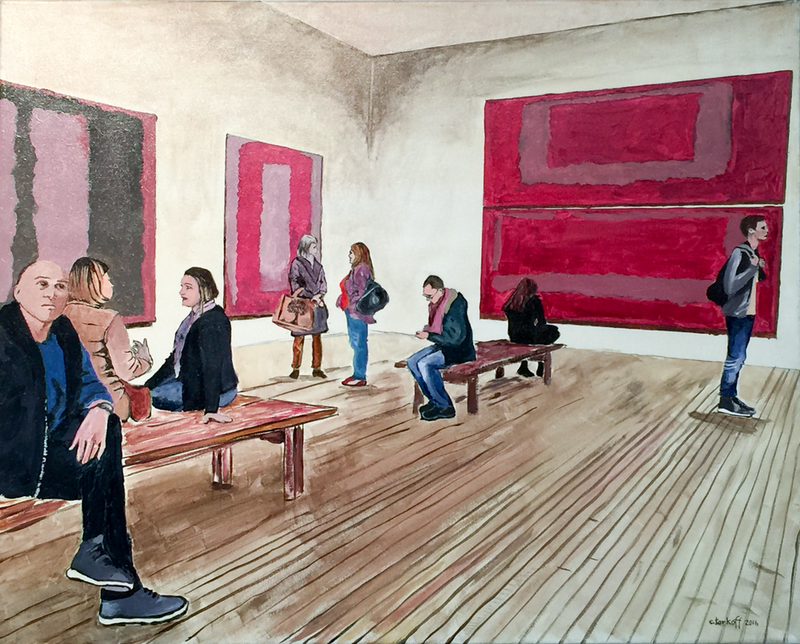 We intersperse annual shows like the Ekphrastic and Juried Shows with new themes such as last year's Philadelphia Places Show and this year's Generations Show. If you join us, you can suggest a theme for next year's September show! Also, as a member, you have the opportunity to use the gallery for your own solo show! That's a huge benefit.